21st September, Yancheng: All Events gold medallist and topseed, James Lui of Hong Kong and Team gold medallist, Choi Hyeon Ji of Korea ended the 28th East Asian Tenpin Bowling Championships with victory in the Men's and Women's Masters final. 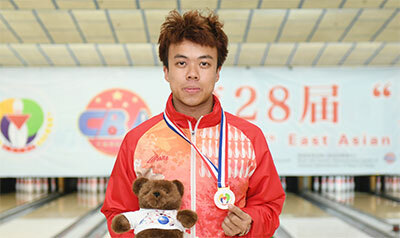 In the best-of-3 Men's final match, Lui lost the first match to Trios gold medallist, Zhang Zhiyong of China A, 196-256. But Lui bounced back with a 231-214 win over Wang to force the tie into the third and deciding match. Wang started off with a split in his opening frame as Lui converted a single pin spare. The Chinese could not find any strikes in his next two frames while Lui doubled in the second and third frames. Lui then went on a strike-fest, reeling in ten strikes--in-a-row to romp home a comfortable 290-193 victory to win his second gold medal of the championships. The champion had earlier defeated another Chinese, Qi Wankang, 2-0 in the semi-finals to advance to the final. Lui ousted eighth-seed, Lin Hsin-Feng of Chinese Taipei, 2-0 in the quarter-finals and Lin Bing of China B, 2-1 in the Round of 16. Wang had to work hard when he beat two gold medallist, Oh Jin Won of Korea, 2-1 in the other semi. Wang also defeated Sol Kum Song of DPR Korea, 2-0 in the quarter-finals to advance to the semi. 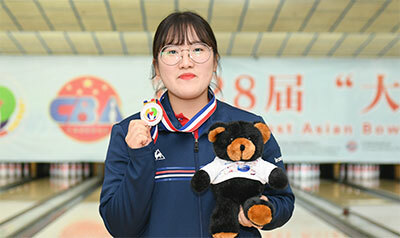 In the women's division, Korea retained the Masters title after fourth-seed, Choi brushed aside compatriot, Lee Hyeon Gyung, 2-0 in the all-Korean final to pick up a second gold medal for the Korean women. The champion edged 16th-seed, Fang Juanjuan of China A, 2-0 in the first semi-final match to advance to the final. She also dispatched fifth-seed, Wang Ting-Wen of Chinese Taipei, 2-0 in the quarter-finals and 13th-seed, Chan Shuk Han of Hong Kong, 2-1 in the Round of 16. Lee narrowly beat Singles gold medallist, Milki Ng of Hong Kong, 2-1 in the other semi and another Taiwanese, Wang Yu-Huei, 2-0 in the quarter-finals. Lee sailed past Doubles gold medallist, Peng Rui of China A, 2-0 in the Round of 16. Korea topped the overall medal tally with 5 gold, 4 silver and 9 bronze medals. China A finished second with 3 gold, 7 silver and 3 bronze medals. Hong Kong was third with 3 gold, 1 silver and 4 bronze medals while Chinese Taipei took home 1 gold and 5 bronze medals. Five nations, DPR Korea, Hong Kong, Korea, Chinese Taipei and China with three teams comprised of 42 men and 21 women taking part in this year's championships hosted by Yancheng Bowling Association with main sponsor, Jiangsu Dafeng Rural Commercial Bank and other sponsors.